Decking oils will transform a garden that's been battered by winter, but which finish to choose? With an increasing amount of crossover, it’s understandable that there’s often some confusion around the right product to buy for decking. In a nutshell, if you’re looking to add some colour to your planks, decking stains offer the widest range of shades in both solid and translucent finishes, while decking oils are best if you’re after a colourless treatment that sinks into the wood to protect from within rather than forming a layer on top. So, if you know it’s the latter you’re after, let’s get on and find the best decking oil for the job. Use our handy step-by-step guide on how to install decking to create the perfect decked area in your garden; we also have buying guides to the best decking paints and the best decking stains if decking paint isn't your bag. That’s obviously not to say that there aren’t colourful options out there: with the largest range of shades to choose from as well as, most importantly, a high level of protection, our top pick is Ronseal Ultimate Protection Decking Oil. However, each of our choices easily earns its keep, with some boasting better UV protection for decking that stays bright across the seasons and some with lower-odour formulations for peace of mind, so keep reading to find that one that will best suit your needs. Softwood, hardwood; smooth or grooved; bare or pre-treated; this Ronseal decking oil not only works on all manner of decking, it works wonders. Its specs are impressive – rainproof in just 90 minutes and up to twice as resistant as other decking oils – and reviewers gave it the praise to back them up, saying that this oil seemed to last forever and that rain instantly beaded off, adding that it was easy to apply, fast-absorbing, and cleaned off tools smoothly. All this, plus a choice of seven colours and a low VOC content, make it fantastic all round. 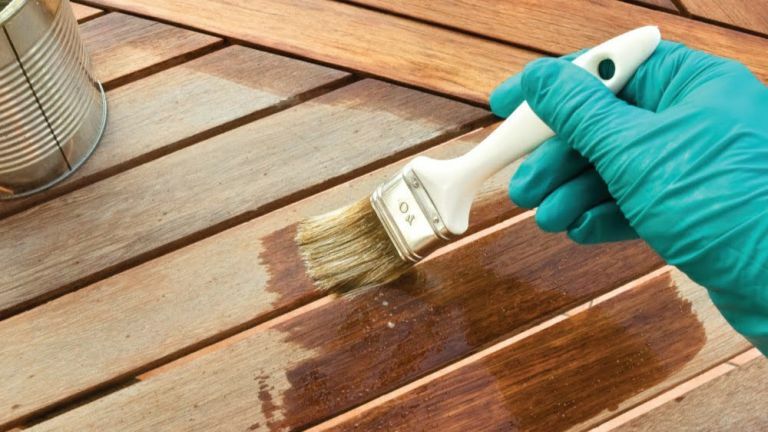 The formula of this Cuprinol decking oil means it can be spray-applied as well as painted on for an even faster finish, but it has more cleverness to offer still. It’s designed to penetrate deep into the wood to replace the natural oils lost over time through weathering, and to offer deep-seated protection against splitting and drying, while the tinted oil brings out colour in greyed wood for a fresh look. Reviewers loved the rich, almost glossy look it imparted to their boards, and said that rainwater just beaded off, proving its weatherproofing prowess. A steal at around £30 for 5 litres, reviewers were left impressed by the excellent value of this decking oil, and found that it performed especially admirably for the price, offering great coverage, easy application, and effective waterproofing straight off the bat – one user commented that water now runs off their deck like off a newly waxed car. Longer term users were pleased with this product’s longevity too, and found that its UV-protective formula kept wood from bleaching or greying in the sun, or weathering at all over a harsh winter. Possibly the most eco-friendly decking oil on our list, Everbuild Lumberjack wood preserver is a low-solvent and low-odour solution, which not only means fewer harmful fumes released into the atmosphere, but also fewer toxic nasties for you to breathe in while you’re applying. If you suffer from a respiratory disorder or are just a bit nervous about using harsh chemicals on your deck, this one is a good bet. Plus, it’s fast-drying, can be applied to wet timber without losing any of its mojo, and penetrates the wood deeply with a fungicidal, algaecidal and anti-decay formula – what’s not to love? Start as you mean to go on with this decking oil by Barrettine, our best for newly-laid and untreated planks. Its all-in-one formulation is designed to nourish, protect and stain in a single step, leaving you more time to enjoy the sunshine. When the weather does inevitably take a turn, the water-resistant formula means that rain will bead and run off without having the opportunity to soak into the wood, reducing the risk of splitting, while the finish is said not to crack, peel or flake away, leaving long-lasting protection. Why not apply your oil fast with the best deck sprayers?